Whenever I tell someone I have a waterfall on my place, they look at me quizzically or pityingly, as though I've completely lost the plot during this extended dry time, and am seeing mirages. But I really, really do have a waterfall, with about a 15 foot drop, in my steepest gully of all. Ok, not all the time. In fact, not for the last 3 years, but sooner or later, it'll rain enough and the waterfall will be back. The 56mm (2.25 inches) of rain we've had in the last fortnight has certainly created a lovely green velvet across the paddocks, with the annual clover just barely pulled back from the brink of death by the rain. But I doubt there will be a waterfall yet. As we head in to winter, I don't expect to see a huge amount of growth, but at least there's enough soil moisture to allow the plants to rebuild root reserves and get ready for spring. I have no idea where the sheep will be this morning--whether the pull of shelter downwind has been stronger than the pull of forage upwind is anybody's guess. So I'll go for a hike and see where I find them. If they are toward the eastern end, we'll make a circuit through Old Cabin and up Waterfall Gully. If they are at the western end, I'll take them for a graze through the Back Gully Reserve. Showers are predicted, so I'll have to carry my fancy wet weather gear, and my plastic ziplock bag for my iPad. Over the last few weeks of trialling Come Shepherding With Me, the essentially solitary nature of shepherding, which I love, has come up against the rather weird feeling of sharing what I'm doing with a large, virtual audience. This, not surprisingly, changes the experience for me--not in a bad way, just different. I have to be careful to hold my attention where it really needs to be--with the flock and the dogs--instead of trying to type a photo caption one-handed (or with frozen fingers). And I'm conscious throughout the circuit of trying to convey as well as possible what I'm experiencing in the field. Thinking it all over, I've decided to reserve my full-day shepherding to myself. I'll still post my report at the end of the day, but I won't take my iPad with me, and I'll try my best not to think about what I would be sending you, if I did have it with me. I've rearranged my schedule a bit, to make Mondays my full day, so I won't be posting a new Come Shepherding until Monday evening. END OF DAY NOTES: For a change, things went according to plan--in fact, a gentle easterly breeze started up about 9:30 and drew the sheep over the ridge toward Old Cabin, giving us a head start. It was a beautiful morning, no showers (good for me because I forgot to bring my rain pants) and mostly sunny. The breeze, which was distinctly chilly at first, gradually came around to the NW, as forecast, and we were in position to take advantage of the veering--just where I wanted the flock to go. It was an easy circuit, something I feel I'm getting better at making happen. The shift is in me, more than the flock--I'm more conscious of not deciding exactly where I want to go, but rather thinking through where they might want to go, in combination with forage pull and wind pull. As a consequence, my circuits increasingly have a feeling of natural flow, rather than human push. Nicer for everybody in the picture! I shot 4 videos (you'll have to go to Instagram, Facebook or Twitter to see them): one of skylarks singing just as I started out, and before the wind came up, 2 of sheep going steadily and peacefully through gates, and one lucky one of wedge-tailed eagles flying over us. 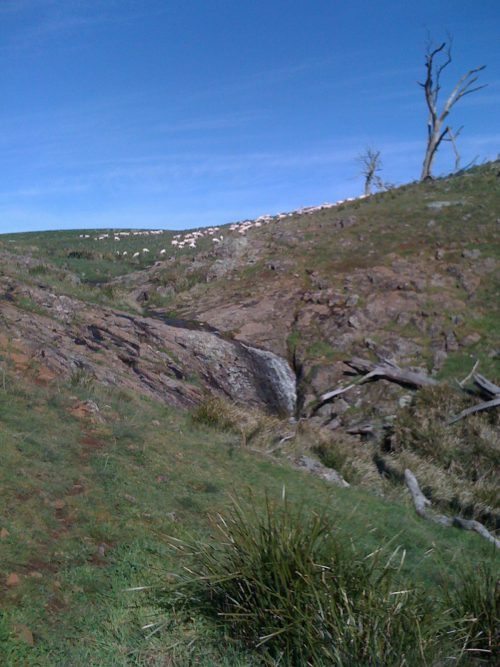 The sheep were still in the Waterfall Gully about 3:30 when I ran the dogs up the Lucerne Paddock. Oh, and on the way back home after the circuit, I spotted a rare sight: a mole cricket above ground--photo below. Skylarks singing. I don't know if you'll be able to hear it over the wind noise. P1: The drop-off into the waterfall. P3: Vicki checking out the iPad. I actually had to back up to get this shot--otherwise it would have just been her eyeball. P4: ....also the pack. I have just removed a section of elastic cord from her mouth, which she was quite determined to eat. She and Leo are forever pulling on my pack straps to get my attention. P5: Heading east in Old Cabin, grazing slowly and enjoying the fresh forage. P6: Grazing NW now, as the wind wings around to the forecast northwesterly. Still in Old Cabin. This is how you want your sheep to come through a gate: at their own pace and ready to graze when they get through. After a detour to the bottom of Waterfall Gully--and the lucerne patch there--now grazing into the main part--the reserve where the waterfall and native diversity are to be found. While I can't yet figure out how to recapture the Instagram videos here, I did catch this eagle on the ridge above us while the dogs and I were having morning tea. Telephoto, of course! 2 of 3 wedge-tailed eagles that are making their third pass over us this morning. This time I was ready. P7: Heading across the hill at the top of Waterfall Gully. The gate up there is open back into the Basin Grazing Area, so we'll leave them to it and go home for lunch via the lucerne. P8: The mole cricket. He's about 2.5 inches long. They spend most of their time in underground tunnels, some of which are specially constructed to amplify the mating "call" of the male. The top of the waterfall--you can't see the full depth from this angle. This photo was taken in October, 2009. There was 200+ mm (8 inches) of rain in August and September that year. My wonderful old dog Mac (2000-2013) working just above the waterfall in February 2013, the beginning of the current 3-year dry period.